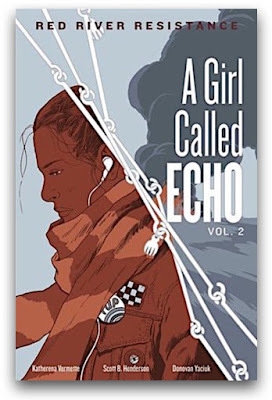 Echo Desjardins's story began in Pemmican Wars (HighWater Press, 2017), the first volume of Katherena Vermette's A Girl Called Echo graphic novel series. Echo is a thirteen-year-old Métis girl placed in foster care, dealing with her new circumstances when she repeatedly time slips onto the prairies of the early 19th c. Métis as they hunt bison and are thrust into the Pemmican Wars. Red River Resistance continues Echo's story, this time plunging the teen into the famous altercation of 1869-1870. As their teacher, Mx. 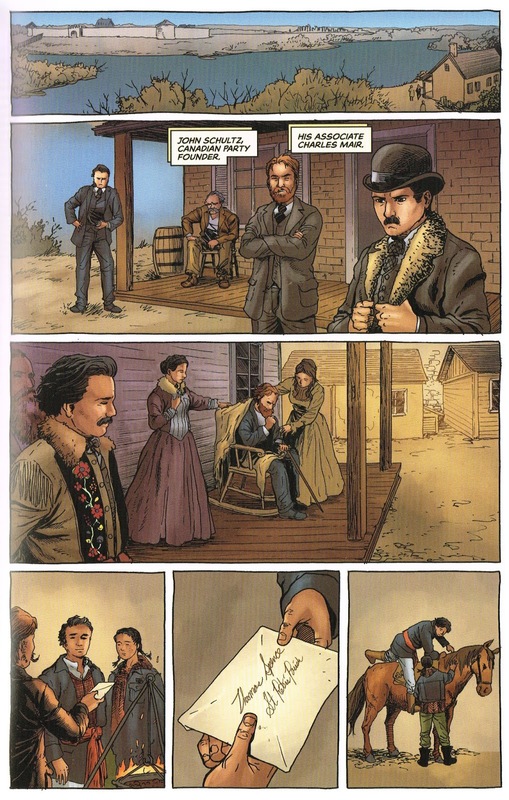 Francois, begins their lesson on the selling of seven million acres by the Hudson Bay Company to Canada, Echo is transported to the Red River colony in 1869 where she witnesses land surveyors, on behalf of the Crown and Dominion of Canada, confronted by Louis Riel and others for trespassing on Métis land. Though Echo returns to the present day to sign up for the Indigenous Student Leadership group and continue with her daily activities, she is transported multiple times to the Red River settlement where the Métis resistance progresses from the taking of Upper Fort Garry through the organizing of a provisional government and the attacks after the trial and execution of Thomas Scott. 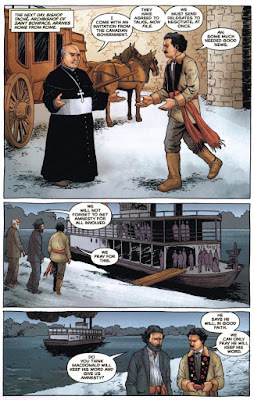 Though the history of the Red River Resistance of 1869-1870 is well documented in the timeline provided at the conclusion of the book, along with a map and the 1870 Métis Bill of Rights, telling the basics of that conflict in a graphic novel format, emphasizing the illustrations with limited dialogue, is clever as it leaves room for discussion and enquiry. 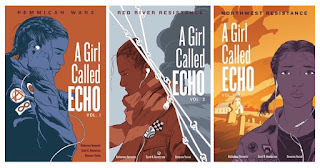 Moreover, because Katherena Vermette embeds Echo's own life of struggles in the basics of the resistance, Red River Resistance becomes more an echo of fitting in amidst conflict than simply teaching history. With Scott B. Henderson's illustrations, coloured by Donovan Yasiuk, the story is fuller. It is realistic but goes beyond an illustrated encyclopedic entry. 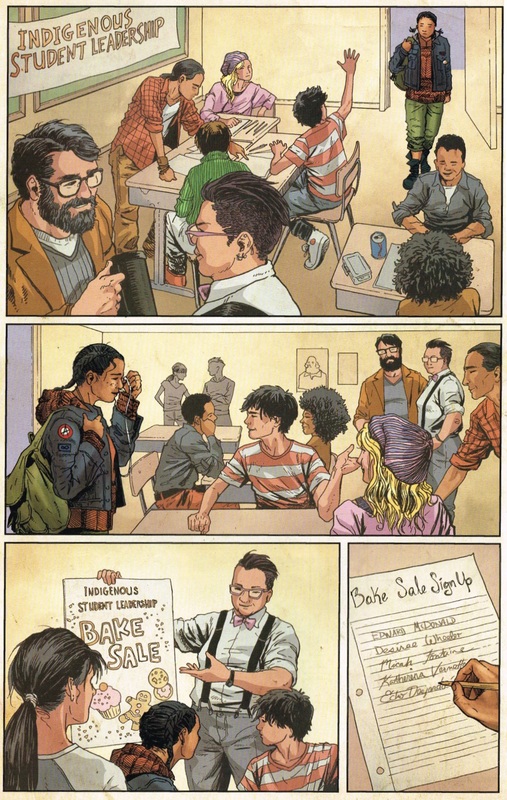 It reveals an inclusivity of people and story and takes the perspective away from the history textbooks and into that of the people who endured the injustices and strife thrust upon them. 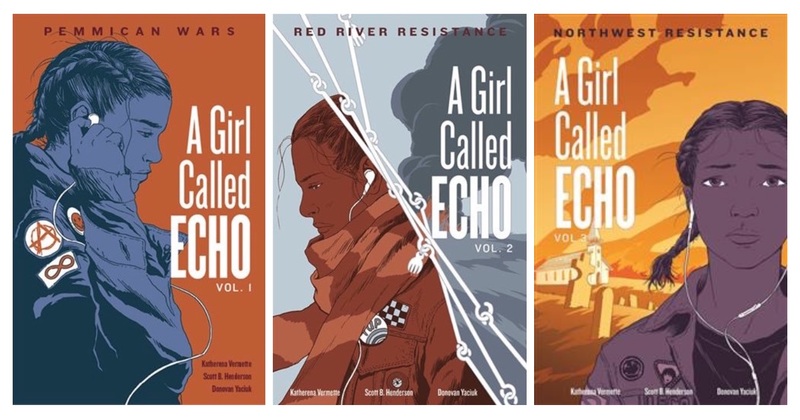 Volume 3 in the series, Northwest Resistance, is set for a November 2019 release.